Greece is the only European country facing active left-wing terrorist groups. Arguably, this is no surprise, since the phenomenon has deep roots reaching back generations. Several terrorist groups were established in the country after the fall of the military dictatorship in July 1974. Two of them came to dominate the radical left landscape: November 17, named after the student uprising at Athens Polytechnic in November 1973, and Epanastatikos Laikos Agonas (Revolutionary People’s Struggle), hereafter ELA. November 17’s first target was the CIA station chief in Athens, Richard Welch. He was shot dead in December 1975. The group went on to target police officers, US servicemen, diplomats, right-wing journalists, businessmen, judges and politicians. For its part, in those years ELA planted dozens of bombs in banks, government and corporate buildings, and police stations. ELA stopped attacks in January 1995, but four of its members were arrested in February 2003. November 17’s operatives were very elusive. A member was not arrested until 2002, when Savvas Xiros injured himself in a botched operation and was apprehended by the Greek police. This led to a breakthrough and several arrests. In December 2003, a three-member tribunal convicted 15 members of the group for several offenses. At that point, many believed that the end of red terrorism was near in Greece. However, a new group emerged – Revolutionary Struggle (RS). In 2003 it bombed an Athens courthouse. It followed up in 2004 with attacks on the Greek Labor Ministry and the police. In 2005 RS published its manifesto in the Greek satirical magazine To Pontiki. It set out the group’s revolutionary, anti-globalization and anti-American ideological positions. an act of war against Muslims and it can be the cause of retaliation from armed Islamists. And the attacks in Madrid and London prove that the victims of this retaliation are not state oﬃcials who take these criminal decisions … but the people who suﬀer the consequences of these policies. We do not deny, however, the responsibility of the European and American peoples to the degree they tolerate or stay indiﬀerent to the neo-imperialist policy of their governments against the people of the Third World. In other words, RS endorsed the jihadi view of the Madrid and London bombings as legitimate attacks against the British and the Spanish voters who elected Tony Blair and Jose Maria Aznar, respectively. In January 2007, RS gained worldwide attention when it carried out a rocket attack against the US embassy in Athens. In response, the State Department designated Revolutionary Struggle a foreign terrorist organization in May 2009. How could Hezbollah resist the Israeli raid [in 2006] eﬀectively without weapons and infrastructure? And how would it be able to maintain its status as a resistance organization if it did not prevent the concerted eﬀort of the Western occupation troops in Lebanon to disarm [the group] with the help of their allies in the Lebanese government? In 2010, RS was dissolved after the arrest of senior members by the Greek police. The group was apparently led by Nikos Maziotis, an infamous militant, and his wife Panagiota Roupa. 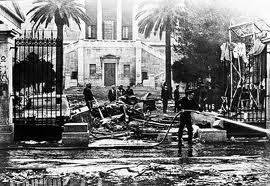 Now there is a third generation of left-wing terrorists in Greece. It targets police officers, government buildings and foreign embassies. The main groups are the Conspiracy of Fire Cells (Synomosia pyrinon tis fotias) and the Group of Popular Rebels (Omada laikon agoniston). Like RS, the new terrorists have embraced an ideology that combines anarchism and nihilism. Their statements are usually poorly-written and superficial. As opposed to Marxist-Leninist groups like November 17 and ELA, they do not seek to change society and build socialism. Instead, their main goal is to confront the state and undermine social stability. Most of their members tend to be students or unemployed young men and women under the age of 30. That means that they often lack operational experience and skills. For this reason, some of the new terrorists have received logistical support and training from the Greek underworld. There are a variety of explanations for the causes of individual radicalization, ranging from personal experiences, such as victimization and love for a radical, to group-level factors such as political grievances. To begin with, some individuals join terrorist groups because they believe they were victimized by the authorities. A classic example of this subcategory is Nikos Romanos, who witnessed the killing of student Alexis Grigoropoulos by a police officer in December 2008. In some cases, radicalization is the result of a perceived grievance rather a witnessed event. According to McCauley and Moskalenko, ‘sometimes an individual is moved to individual radical action and violence in response to political trends or events’. The Greek riots of 2008 following the police killing certainly radicalized some youngsters who had been involved only in vandalism in the past. Additionally, individuals have joined left-wing groups because they have an emotional attachment to the leadership or an existing member. This is probably the case with Panagiota Roupa, who is married to the founder of RS. In fact, most Greek terrorist groups recruit members from a small pool of sympathizers in order to avoid inﬁltration by security agents. Relatives and lovers in particular are preferred because affection and kinship reinforce internal cohesion against external enemies. In general, the third generation of Greek terrorists has been less lethal but more unpredictable. Their youth means that left-wing political violence is far from over. It is essential for Greece to adopt a new counter-terrorism doctrine that will allow it to tackle this long-standing security problem. * Dr. Emmanuel Karagiannis is a Senior Lecturer at King’s College London’s Department of Defence Studies. C. McCauley and S. Moskalenko, ‘Mechanisms of Political Radicalization: Pathways Toward Terrorism’, Terrorism and Political Violence, 20 (2008), p. 419.